Take a walk on the wild side. 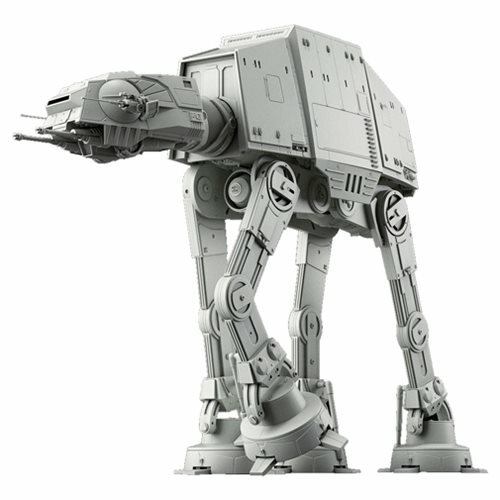 From Star Wars: The Empire Strikes Back, comes the AT-AT in 1:144 scale! The 4 legged Star Wars AT-AT 1:144 Scale Model Kit has stunning details even down to the side paneling, which can be removed. Legs feature individually movable joints that can even bend low enough to recreate the massive behemoth being defeated. Set includes snow themed dedicated display base, 2x laser-effect parts, leg dampers, 2x pilot(unpainted), articulated head and legs, 2x laser gun, part swappable landing gear options, water slide and sticker transfer options. A nipper or sprue cutter (sold separately) is required for assembly, but does not require glue. Measures approximatley 6 1/3-inches long. Ages 15 and up.